Somewhere in the past week, Rupert Murdoch has become a rugby union fan. While I don’t follow his Twitter feed religiously — there is food to be digested after all — I’ve never known him to tweet about sport. Yet since Monday, there have been three in a row about rugby. Including one sticking the boot into the Poms. Great win by Australia at Twickenham. Can't wait for final against great All Blacks next Saturday. Ignore complaints from whinging poms. Maybe he’s decided rugby is safer ground after the ruckus he caused in labelling Republican Ben Carson a potential ‘real black President’. Or maybe he’s excited about this weekend’s Rugby World Cup final because it’s expected to mark his first public outing with rumoured new girlfriend, Jerry Hall. At any rate, we can thank the Murdoch press for one of the best sledges ever, courtesy of The Daily Telegraph, which renamed All Blacks captain Richie McCaw a ‘Richetty grub’ for his mastery of ‘the dark arts of breakdown cheating’. 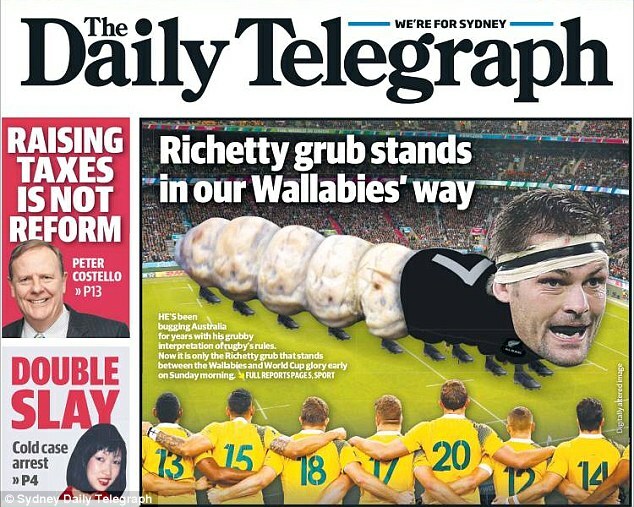 “Adept at using its knees and elbows freely on a rugby field, it has been officially registered as a pest in Australia,” was how the paper described the species, while also defining Sunday’s match referee Nigel Owens as a ‘Richetty grub connoisseur’. Fortunately the grub is an endangered species and may not be seen again after this weekend. The other great call of the week came from the tweep who likened Wallaby Bernard Foley, he of the magic boot, to actor Eddie Redmayne. 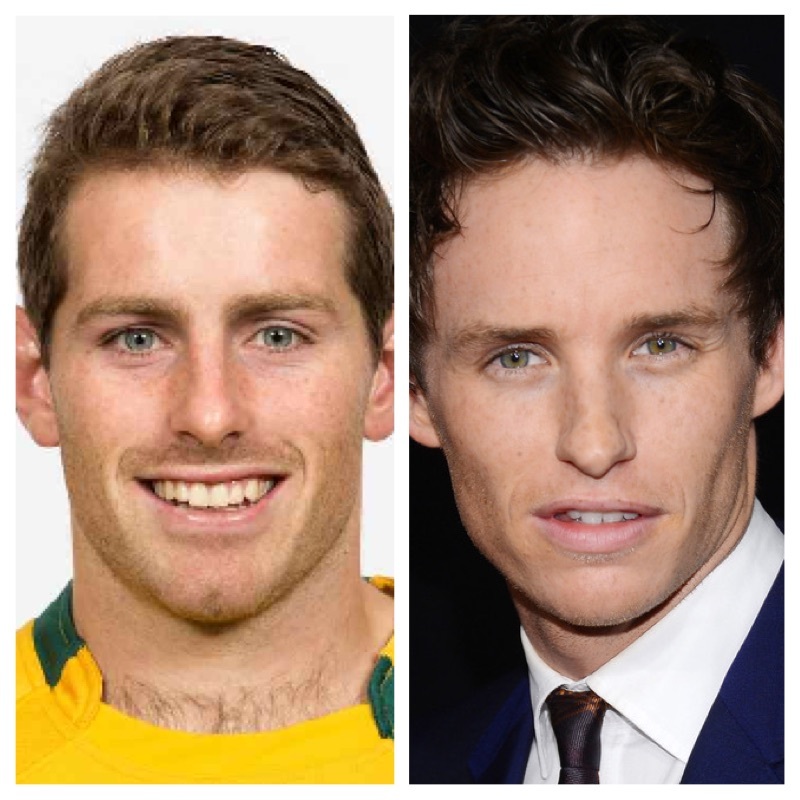 Let’s just hope Bernie brings some of Eddie’s Oscar-winning form to Twickenham. With Halloween descending on us this weekend, FIFA has decided to take its own horror show to new levels for the occasion. Septic Bladder, the head of soccer’s ‘governing’ body, did an interview with Russian media in which he said the whole corruption scandal around soccer’s ‘governing’ body was the result of UEFA boss Michel Platini’s envy and jealousy. Septic let slip the executive committee had agreed to give the 2022 World Cup to the US before Platini switched to Qatar. Confirming all suspicions that these exercises in free voting are rigged tighter than a Sydney to Hobart yacht. I dunno, Sepp, I’m with this guy. Meanwhile, the list of candidates for Septic’s job has been released. It includes names like Jerome Champagne, Gianni Infantino and Tokyo Sexwale. Better than fiction, this yarn. Still on a Halloween theme, these guys are trying to suggest Jordan Spieth costumes are all the rage this year. Yep, scary stuff. Not as scary as the stuff coming out of Lewis Hamilton’s mouth after he won his third Formula One title last weekend. I can think of two things, mate. Childbirth and humility. Fresh from knocking down a Japanese kid playing a friendly game of street rugby, London mayor Boris Johnson has tried his hand at tug of war. Here’s how that went. Former tennis ace Marat Safin reckons it’s much easier to win a Grand Slam these days than when he was running around the court. I reckon Marat could earn himself a gig with the Four Yorkshiremen. Roger Federer has been busy channeling his inner badass, encouraging Australian Open ballkids to break the rules and ask him for his autograph. Speaking of cool, picture this. You’ve just scored a goal and in that moment you’re the coolest person on the planet. You saunter over to your team’s fans to bask in their amazement at your unworldly skills. And it all goes horribly wrong. Let’s hope the All Blacks are similarly upended at Twickenham. Have a good weekend, everyone. And go Wallabies! Fingers and toes crossed Kaz…..and God bless our No.8! Let’s hope he has a blinder!